Ninety plus choristers now form the choir, which is a registered charity. Its aim is to support all good causes with fundraising and to undertake around 24 concerts each year, although recent years has seen that figure regularly exceeded. A concert choir, it regularly enters competitions to maintain its stage performance standard. Successes include first prize in the 2004 and 2006 National Eisteddfodau, and in 2005 won Best Male Choir in S4C's Cor Cymru, also reaching the final in 2007. In 2006 it won the Gold Cup at the Cheltenham Festival of Music. 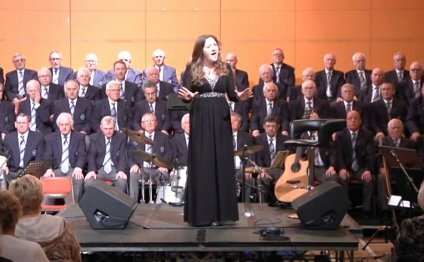 After success in an international competition in Verona, its most recent successes were as semi finalists in the 2008 Radio Cymru Andante Competition and being in the prize money in 2010 at the Majestic Choirs Competition on the English Riviera. It also travels annually, with tour destinations including France, Jersey, the Netherlands, Germany, Italy, Spain, Ireland and Belgium. Bridgend Male Choir travels regularly, with tour destinations including France, Jersey, Canada, Netherlands, Germany, Italy, Spain, Ireland and Belgium. In 2010, the choir toured to the English south coast and again to its north west region. In 2010 the choir celebrated its 50th birthday and released a celebratory CD, Classic Male and a book chronicling its half century, 50 Glorious Years. It performed during the year amongst others with Sir Willard White and Max Boyce and gave concerts at cathedrals in the cities of Cardiff, Bristol and Liverpool. A further highlight was its presentation with a Citizenship Award from the Mayor of Bridgend County Borough in recognition of helping to raise in excess of £1 million for charity and as ambassadors for Bridgend.